In August of 2010, a fire that burned 12 acres in Irvine, California was allegedly started by a golfer. His ball had strayed off the green and into the rough, and something dangerous happened when he hit the ball off some rocks. After a scientific investigation, we know what lit the fire. Somehow, his club had created sparks that roared into a massive fire. The Orange County Register reported that it took nearly 200 firefighters on the ground combined with aid from helicopters to put out the blaze. The following summer, a similar fire was started at Arroyo Trabuco Golf Club, also in Orange County. How were these golfers starting brushfires? Orange County fire investigators asked UC Irvine researchers to investigate. Their research was published recently in the journal Fire and Materials. The lead researcher, a UC Irvine chemical engineering & materials science professor named James Earthman, suspected that the titanium might be to blame. Titanium is a pyrophoric metal, which means it can spontaneously ignite in the air when powderized or sliced into extremely small fragments. More and more golf clubs are being manufactured from a titanium alloy rather than from stainless steel, because they're forty percent lighter, making them easier to swing. The researchers used high-speed cameras and powerful microscopy techniques to try to determine just how people were lighting their golf courses on fire. That began with recreating golf course conditions in the lab. The experimental golf course was designed to mimic the environmental conditions under which the fires were set, like temperature and relative humidity. 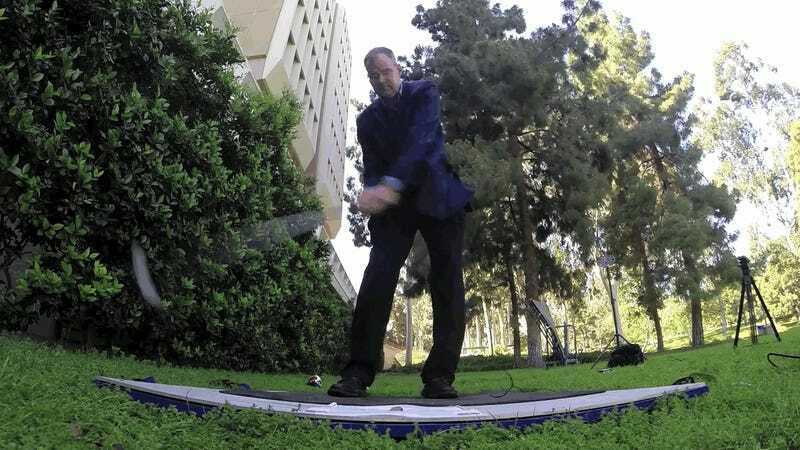 Using two different three-irons and one three-wood whose heads were coated with a titanium alloy, and a second set of irons and woods coated only of stainless steel, the researchers set about smacking some rocks that they dug up from the Arroyo Trabuco Golf Club. The titanium alloy clubs all sparked. None of the stainless steel ones did. Here's how it works: when a club strikes a hard surface like a rock, microscopic fragments of titanium can scrape off. Those particles react with oxygen or nitrogen in the air, causing the particles to ignite. Earthman's research showed that those particles can reach temperatures up to 4400 degrees Fahrenheit, and can burn for up to one second. If the conditions are right, that's plenty of time for the spark to land on some dry foliage and cause a fire. And it's the same chemical reaction responsible for the beautiful halos created when helicopters land in the desert. To prevent early degradation, most helicopter blades are coated with an abrasion strip. This strip, typically made of a metal like titanium or nickel, prevents the leading edge of the blade from being worn down too quickly by the various particulate hazards of the atmosphere. This abrasion strip can handle a lot of wear and tear, but the desert is a harsh environment. Sand is harder than the titanium or nickel that makes up the abrasion strip, so when a helicopter's blades begin cutting through a cloud of sand, the particles hit the blades and send bits of metal flying into the air. Those particles, like the ones that flake off of titanium golf clubs, are then poised to ignite. One chemical reaction, two starkly different outcomes. In the desert, it creates a spectacular, beautiful scene silhouetted against the night sky. On the golf course, particularly in wildfire-prone Southern California, the outcome is far more dangerous. Which leads to an interesting question: in the increasingly dry region, currently suffering from a major drought, should golf courses regulate the types of clubs that can be used? Arulmoli J., Vu B., Sung M.J., Mohamed F.A. & Earthman J.C. (2014). Spark production by abrasion of titanium alloys in golf club heads, Fire and Materials.